Aging and Martial Arts – what’s around the corner? “We get slower as we age, but we also age when we start to go slower.” said Nicholas Thompson in his recent wired article called “An Aging Marathoner Tries To Run Fast After 40”. Now that I am reaching the end of my 40s the ravages of the aging process are starting to make themselves heard and they roar particularly loudly when I’m off to training. This last year has been plagued with one injury after the other that has put a massive dent in my training and my confidence. One injury can be demotivating enough but successive injuries made me start questioning whether my body was still capable of recovery. “Yes you are getting injured,” said my MD “but the good thing is that you’re a healer!” He said it with such enthusiasm that I had to believe him. Heading for Testing Day last Saturday however still filled me with trepidation. Would my body withstand the rigor of 3 hours of training in its current state? The mental challenge was huge. I found it hard to focus and my Mom-brain slipped to child care issues etc while I tried to steer it back on course. My ever supportive husband dealing with his own injury thankfully was there to partner with me during techniques which eased my stress a bit as I knew he was aware of my injured parts. I had to put my expectations for the day into perspective – I was not firing on all cylinders physically so I needed to focus mentally to get through the necessary. 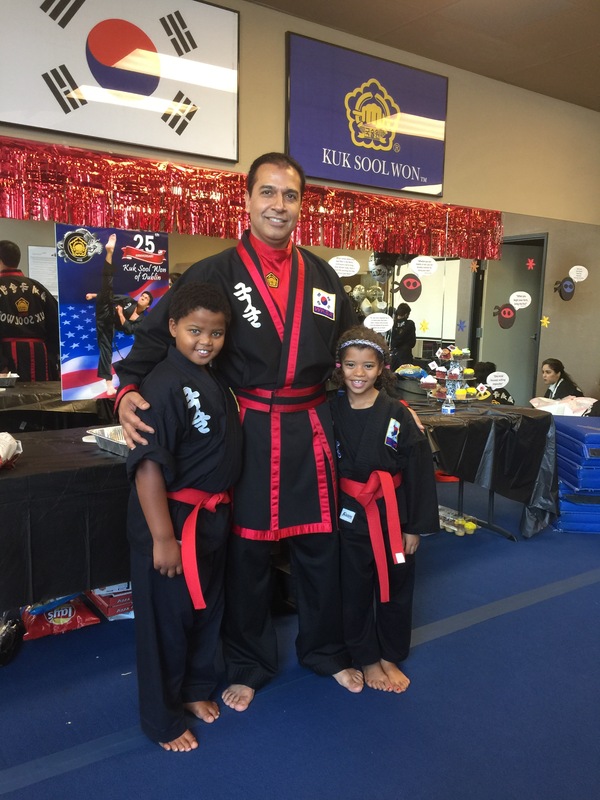 Part of my training involves helping out with the younger students and the sheer delight and enthusiasm they show reminds me why I practice martial arts. It may be easier to participate in an activity that didn’t have the same physical demands but then again when you find something that makes you step lighter and push harder it brings a different sense of satisfaction and self-awareness that is hard to replicate. Also I just think practicing martial arts is cool! So yes it would have been slightly easier if I was 30 years younger but I recently saw a video of a 92 year old doing gymnastics so anything is possible. Nobody knows what awaits around the corner but despite the aches and injuries, I am still able to grow and learn and to me, practicing martial arts is still better than not. PS: Greetings to my fellow Ruckusmakers from the #YourTurnChallenge – Joyce, Estelle, Ann, Patrick and KG Heath! 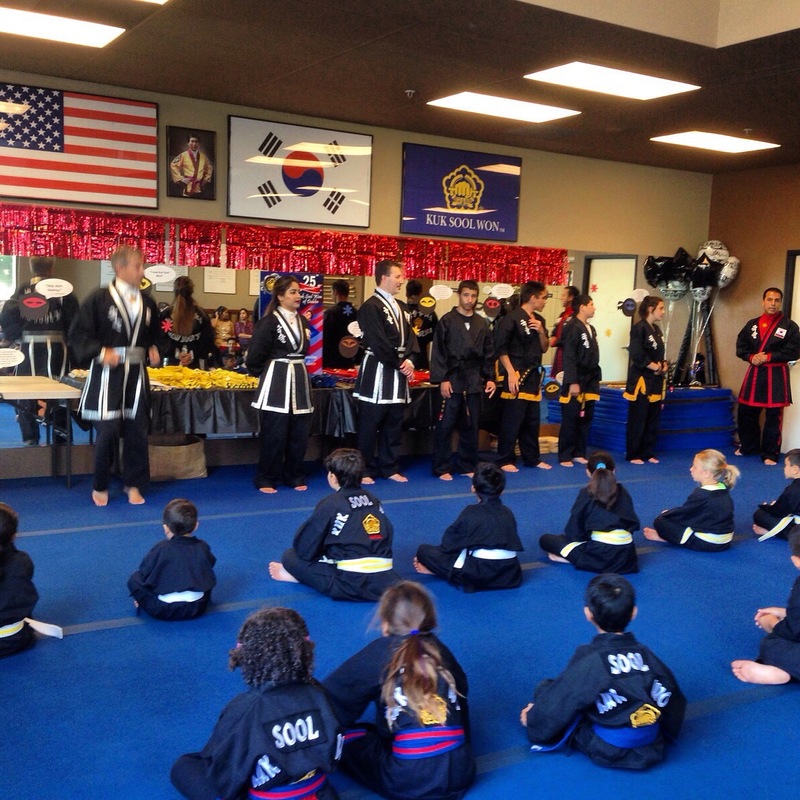 Promotion Day, a highly anticipated event by every martial artist whose art has a belt ranking system. Our household was no exception given that there were four us who would be receiving new belts. On this occasion the dojang is decorated with balloons, ninja faces, trimmings and quotations to celebrate the anniversary of the Kuk Sool Won of Dublin school which was first established by Master Saidi in California 25 years ago. The kids were excited as they would receive their new belts in the morning promotion session and the adults in the afternoon. Another goal achieved. I am not accustomed to setting sporting goals. It hasn’t been a been a part of my life as I never found a form of exercise that appealed to me in the way that Kuk Sool Won does. I enjoy swimming and cycling and even named my bike. I enjoy the fun and rhythm of a Zumba workout too. I guess it’s because with these types of exercise my focus is not on the activity itself but rather on peripheral factors. We are all unique and each of us is fueled by different drivers. I love the buoyancy and look of water, the cool blue color of the ocean or a sun drenched swimming pool lift my spirits. When biking I enjoy the freedom, the beauty of the scenery, the feeling of the wind blowing on my face and the warm sun on my skin. With Zumba it’s the appeal of the music and the fun of shaking what my Momma gave me but in martial arts it is the actual exercise that I connect with. My anxiety levels before a class are no longer as intense as when I first started 8 months ago but nervous anticipation has replaced it. I get to the school early so that I have some time to focus and breathe before class begins. Just doing warm-up is already a way to gauge my progress and challenge myself. My levels of flexibility have already improved significantly and I can now get my legs over my head while on my back without the fear that I associated with this posture in the past. My husband often says that golf is 90% mental and 10% mental. My mental attitude towards doing some of the exercises needs to be re-examined with every bit of progress I make. I am completely rubbish at back falls still but the fact that I roll over backwards at all is a miracle to me! The set up of the dojang excites me like the look of blue water, although that may have something to do with the blue springy floors! Wavemasters are lined up along the mirrors, weapons on racks including bo staffs, knives, spears and even bows and arrows and of course my favorite – swords! Picking up a bo staff is a pleasure in itself. The weight of it which seems to increase the longer I hold it. The excitement of twirling it above my head and visualizing myself in a martial arts movie. Nothing quite compares to the feeling of satisfaction of successfully navigating a sparring session dripping sweat like a leaking faucet. Movement, meditation and mastery of body and mind – crucial elements that underpin any progress in Kuk Sool Won. I have new targets as a blue stripe belt holder that are already set by the comprehensive curriculum but I have personal goals too. To reach 80% flexibility by December in addition to being able to do more than 25 push-ups in one go and to be able to maintain a low stance for more than a minute. These may not seem like much but are quite an ask considering my baseline fitness levels. These goals however are driving me forward. Everyone has to start somewhere. To me though it’s not like any other exercise I have done and the results are evidence of this fact. Before Kuk Sool I saw exercise as a chore, a necessary evil, now however the thought of the physical exertion is secondary to the thrill of discovering new avenues of growth. Exercise isn’t simply exercise when it connects with your soul.